Since my trip to Canada, I can’t help but drink chaï latte. Before, I used to drink the chai in tea version, because it was easier to find in organic stores and healthier than the blends that can be found in supermarkets. The disadvantage is that it must be prepared by making a decoction: boil it in water or milk for 15-20 minutes to benefit from its intensity and properties. So I started looking for a ready-made powder mixture and I might as well tell you that I couldn’t find anything that satisfied me. That is, a mixture of sugar-free spices and other additives. So I looked at several compositions and made my own recipe. We are our own best advocates, as the saying goes. My Chai recipe is quite intense, so you don’t have to put a lot of it in! For some, ¼ see ½ coffee spoon in a cup is enough. You can also use less ginger and cloves if you prefer a lighter taste. I also give you larger quantities, if you want to offer your Chai blend to friends. It’s a nice and original gift idea! If you use powdered spices, mix all the spices until you obtain a homogeneous mixture. Otherwise you can use a food processor. Put all your spices in the bowl and mix all the ingredients for 10 to 30 seconds at maximum power depending on the spices you have to mix. The final result is a beautiful homogeneous powder. 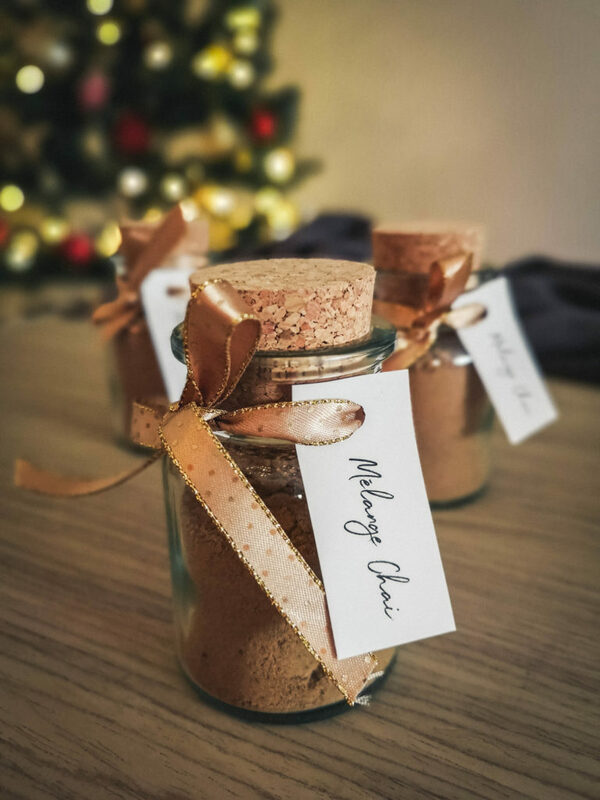 With pretty little jars, it is a nice and original gift idea. A little anti-waste tip if you use a food processor. Once your preparation is emptied, there may be some chaï left. Add a little chocolate powder and milk (almond for me!) to have a delicious chocolate and spicy drink. Of course you can also use this blend to flavour your cookies, cakes, cereals, creams, it works perfectly! My guilty pleasure of the moment: the caramel latte macchiato + chai or the matcha with almond milk + chai ! You can download the recipe here!